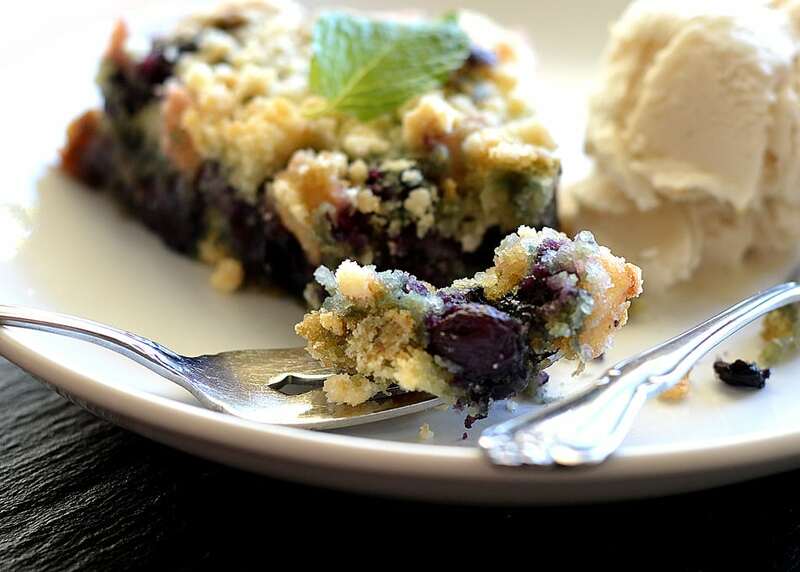 I was completely inspired to create this Immaculate Blueberry Sugar Cookie Tart! 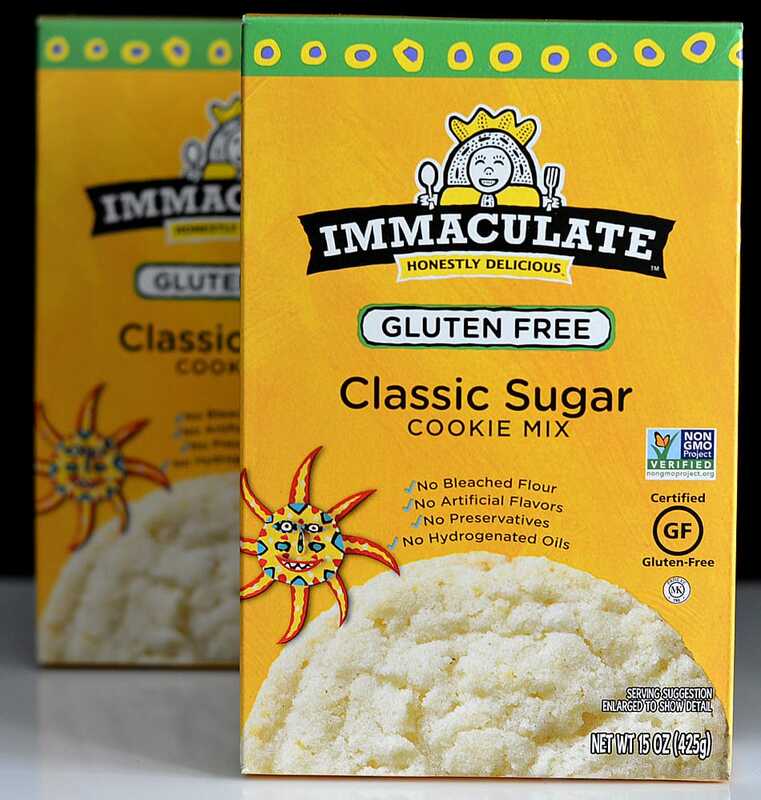 This gluten free sugar cookie mix from Immaculate Baking Company™ just blew me away. The company has a great background story revolving around the owner Scott, who started the company in his garage and through his travels, encountered folk artists who he continues to support by featuring their artwork on the product packaging. Today, that garage-based company creates a line of wholesome and delicious baking products, many of which are gluten free or organic! 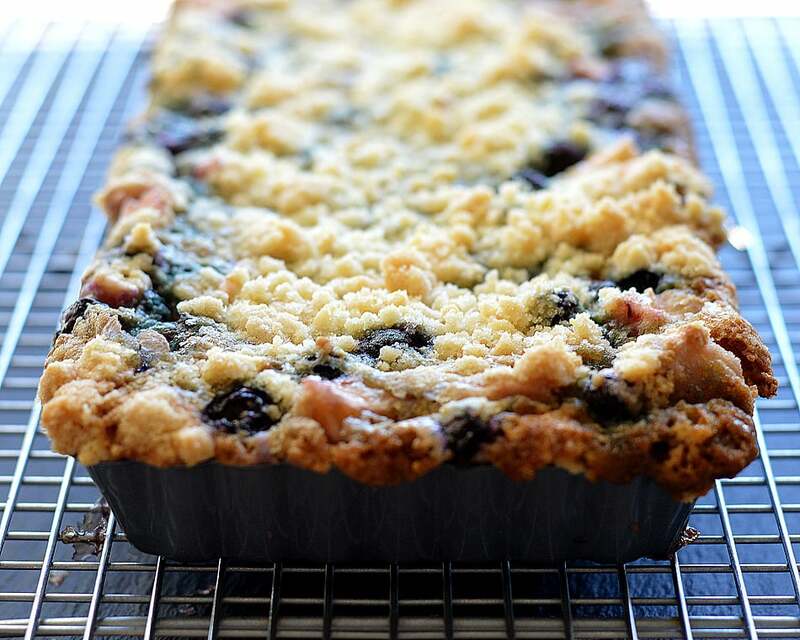 For the filling, I chose blueberries but to sweeten things up a bit, I added one apple cut into a medium dice. Sugar, a pinch of salt and cornstarch are tossed in. If you are keeping with the gluten free diet, most cornstarch is safe, but be sure to read the label. Allow the fruit to sit while you prepare the dough. We’ll be using an entire 15 oz. box of the Immaculate Baking Company’s gluten free Sugar Cookie Mix and prepare according to the directions on the box. 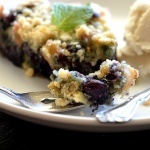 Instead of stirring together, I prefer to use a pastry cutter for this recipe. 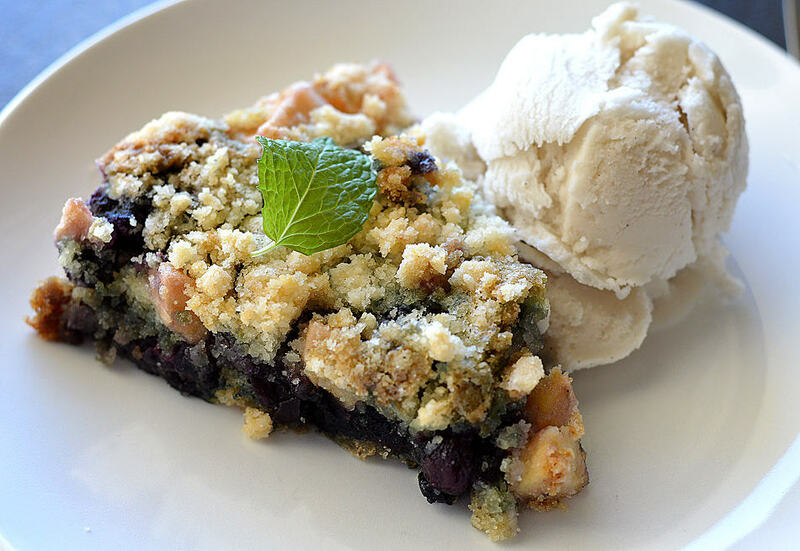 It gives a light crumble, which we’ll be needing for the topping. I take about 2/3 of the dough and press it into my desired pan. 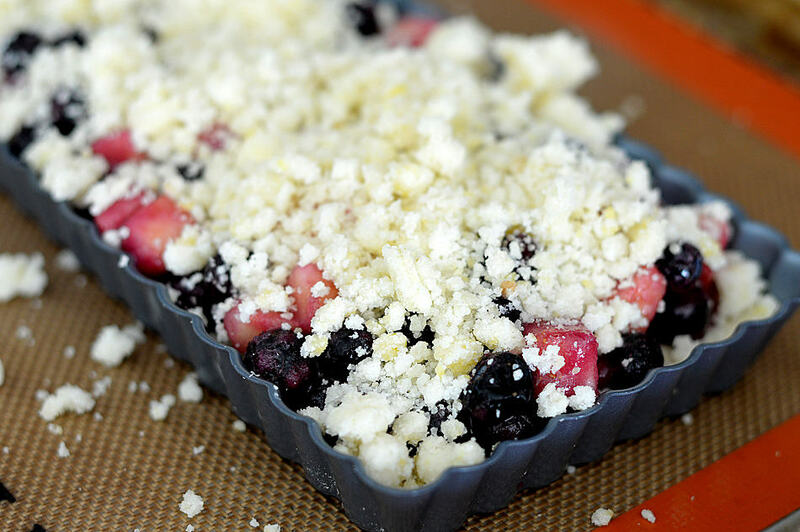 I used this rectangular tart pan with a removable bottom, but feel free to use any shallow baking pan for this recipe. I would recommend that if you are using a pan without a removable bottom to line with parchment for ease of removal. Take the remaining crumbly dough and liberally sprinkle it over top. Bake at 350 degrees until the top is golden brown. For me (using this particular rectangular pan) it took about 30-40 minutes. If the top isn’t done, the base surely won’t be with all of those fruit juices. So take your time. My favorite part were those sugary, crusty edges. Yum! 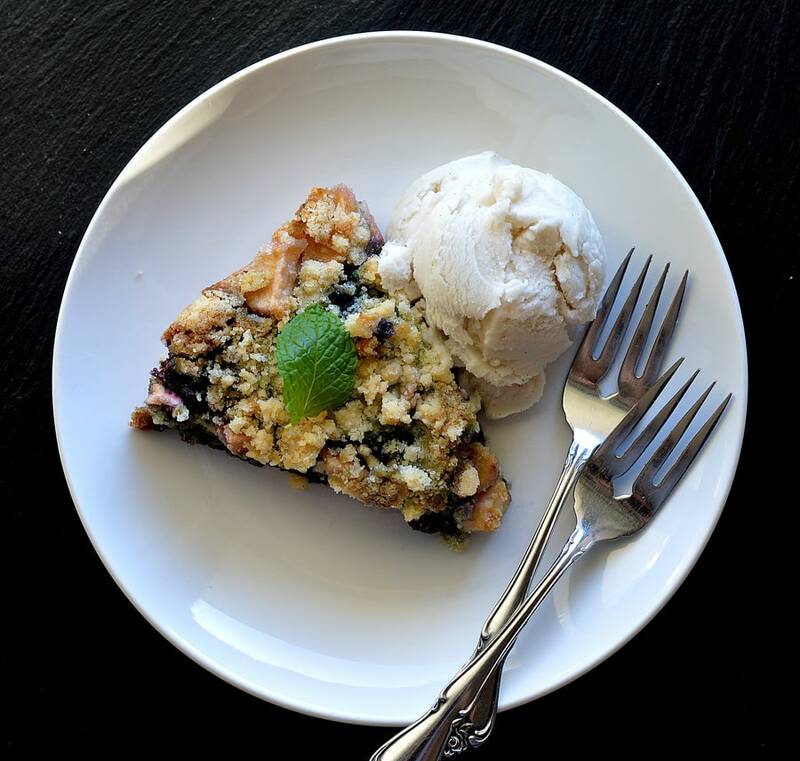 I served it with my favorite dairy & gluten free almond milk ice cream. Garnish with a sprig of mint and serve either warm, or at room temperature. I personally preferred it warm. It’s such a nice contrast to the ice cream. Be sure to visit Immaculate Baking™ online for product descriptions and even more recipe ideas! Also, make sure to download and print a coupon for $1 off any Immaculate Baking product. 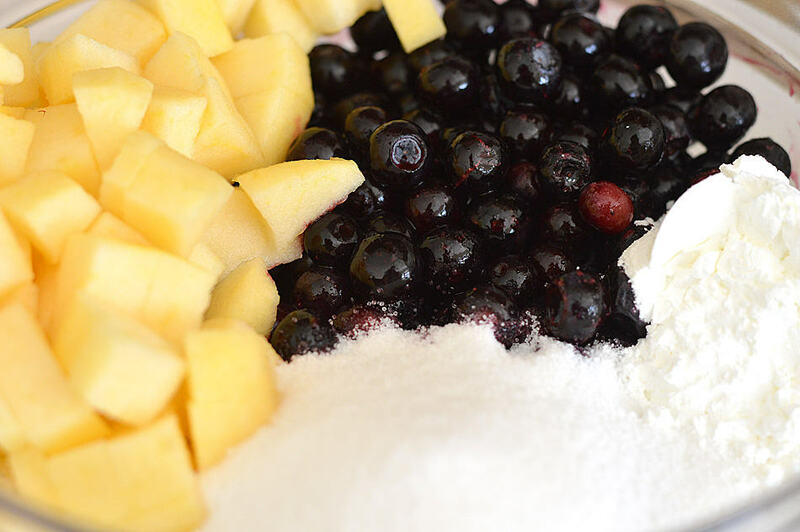 In a large bowl, combine the blueberries, apples, sugar, cornstarch and salt. Stir well to combine and allow to sit, stirring occasionally. Meanwhile, in another bowl, combine the ingredients for the sugar cookies and use a fork or preferably, a pastry cutter. It should resemble a coarse meal. 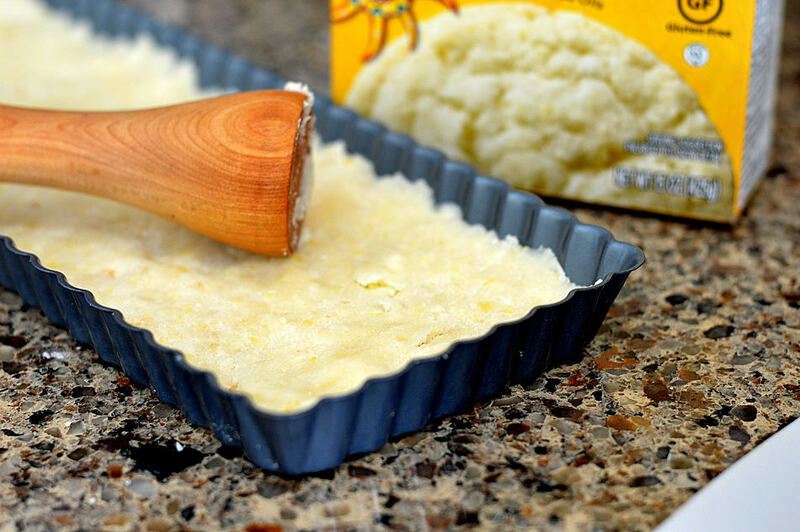 Take 2/3 of the cookie dough and press into a tart pan. If you have one with a removable bottom, it will release cleaner but you can also line with parchment. 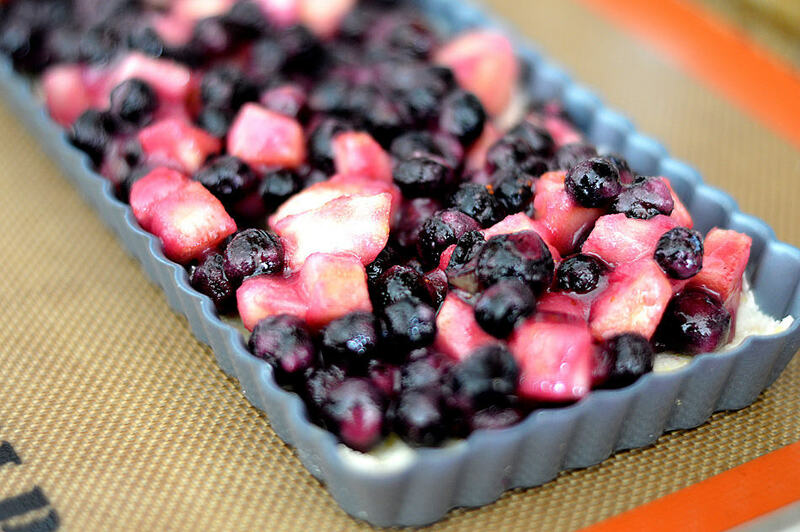 Add the fruit to the tart dough. Do not overfill as the cookie base will expand during baking. Take the remaining crumbled dough and liberally sprinkle over top. Bake at 350 degrees for 30-40 minutes or until the top is golden brown. The baking time will vary based on your oven and choice of pan, so keep a close eye. my vegan daughter loved this! thankyou very much. i used the oatmeal cookie mix for a different take.